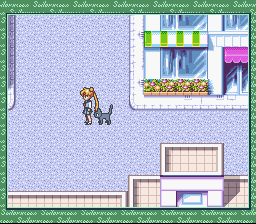 Yep, it’s a Sailor Moon RPG. Pretty nifty, huh? The game is pretty standard I guess; there are some pretty cool things in it though, like the nifty techniques and stuff. 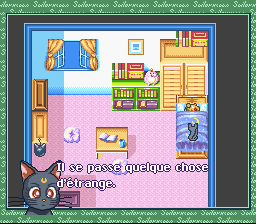 However, it is pretty hard to make sense of things (especially in the beginning) without a good knowledge of the series; the game continues the unfortunate “You’d damn well better know who everyone is before you play, cause no way in hell are we going to explain it to you” syndrome of anime gaming. 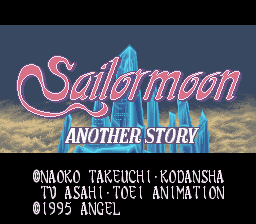 Of course, this game isn’t meant for just your average Joe guy, it’s meant for people who like Sailor Moon. So, uhh, there you go. 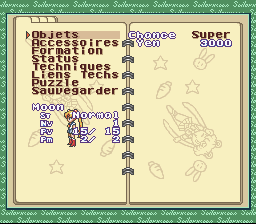 This is a French translation of Bishoujo Senshi Sailor Moon: Another Story for the Super Nintendo. 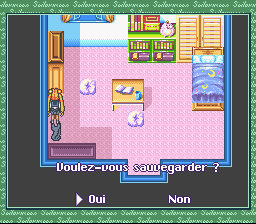 Based on the English translation by Bishoujo Senshi Translations.